Not unlike the current news cycle, the conversation which has dominated the last two years in fashion has been a story of East and West – of the stratospheric rise of figures from former Soviet countries who have, seemingly against the establishment odds, come to define our contemporary outlook on style and dressing. 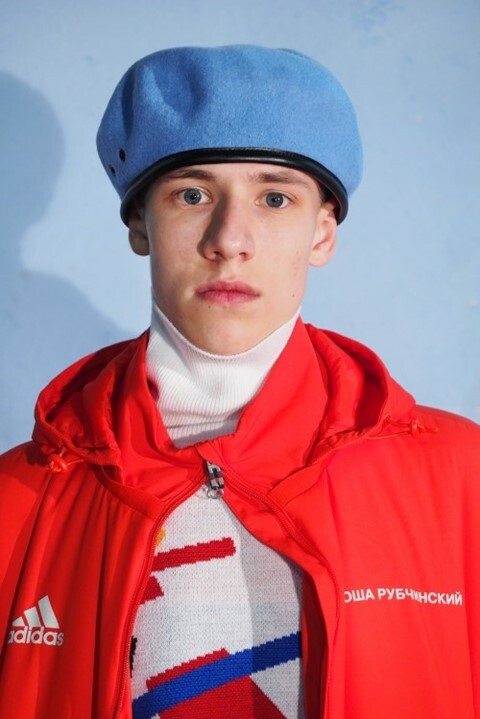 One such person is Gosha Rubchinskiy, who, since he began showing at Paris Fashion Week back in 2014, has become one of the most influential voices in menswear – producing sell-out collections, photo-books, and even a 17-minute silent film – all of which have earned him a host of followers dedicated to his Soviet skate aesthetic. But until yesterday, when he debuted his AW17 collection in the town of Kaliningrad’s Regional Centre of Youth Culture, Rubchinskiy had not shown in his native country of Russia since 2009. For the designer, the formerly-German city separate from Russia’s mainland that he terms “a small piece of Russia in the middle of Europe” made perfect sense for showcasing his new season. While present in the clothes was some of the tailoring Rubchinskiy had experimented with last summer in Florence, as well as graphics inspired by avant-garde Russian artists like Alexander Rodchenko and Kazimir Malevich, at its heart was a football-focussed collaboration with German sportswear giant adidas. “In the Soviet Union, we didn’t have strong local sports brands,” Rubchinskiy explained of his youth post-show, recalling a tale about people customising their shoes to make them look like adidas, as well as his own excitement at receiving a new pair of trainers or a tracksuit from the brand when Russia’s borders and markets began to open up in the 1980s. For the designer, a foray into football gear (like the collection’s shirts and track pants) didn’t feel unnatural, but rather reflected the way that styles are shifting for his followers – rather than belonging to one tribe or the other, you can subscribe to more than one mode of dress without having to reject the alternatives. “In the 90s or 80s, it was separated: football fans were football fans and skaters were skaters,” he said. “But now things are changing, you see skate kids wearing football clothes and you can see football fans wearing skate stuff. Cultures mix, subcultures mix.” Rather than a one-off, the collaboration with adidas will unfold over the next few seasons in the run up to the 2018 World Cup, held in cities across Russia (including Kaliningrad).